I’ll keep this post short and sweet, but I wanted to share a picture of my husband’s latest welding endeavor. His welded boats and trellises have periodically appeared in photos of my garden, and he has recently begun making flowers as part of his garden sculpture experiments. The daisies below are his latest. 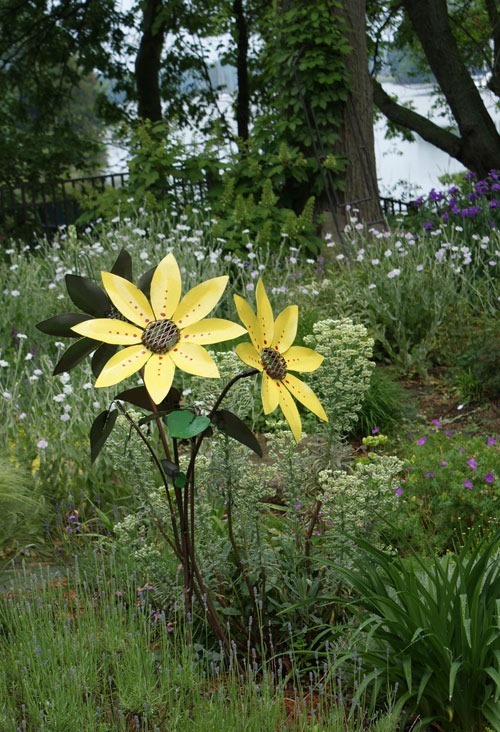 Above: Welded Daisies by Peter T. Evans, a.k.a. the Mad Welder! He is donating this piece to the silent auction to be held June 9 for the “Art in Bloom” fundraiser held by RiverArts and Community Mediation in Chestertown. The piece is 4 feet tall and 20 inches wide. I hope some Eastern Shore Gardeners will attend the benefit and bid on it! Also, in case anyone is interested, I am donating a collection of plant divisions (at least 5) from my garden to the silent auction. Divisions will be selected to suit the winner’s garden. I hope some of you will bid on that as well! Hope to see some of you at the reception. For more information, click here: Art in Bloom! from Amazon.ca. Your book is available from our Toronto Public Library. I used many of your landscaping ideas to start with the redesign of our front yard after a very large ash tree had to be removed last year. Thank you for your wonderful book, Gisela. Greetings! I suspect some of the things I grow down here won’t survive your Toronto winters. ;~)) Glad you are enjoying Covering Ground. My whole garden follows the principles outlined there. By growing lots of spreading plants that are tough and adaptable (but not invasive), I’ve got a fairly low maintenance garden that still looks great. The only catch is the garden keeps getting bigger. Oh well, where would we be without new places to plant? Beautiful daisy sculpture! Does the “mad welder” create other types of garden sculpture for your gardens or for others? Thank you! Glad you enjoyed them! He has done a couple of pieces for other people and is currently working on making daisies and daylilies. I am also hoping that he makes a short section of fence form me that includes some old garden tools.